I am one of the co-founders of Itamus. Our current focus is YourPressure, a system which empowers patients to self-manage their own blood pressure. High blood pressure accounts for 12% of all visits to GPs in England. Despite this, 5 million people are unaware they have high blood pressure and it is one of the biggest risk factors for premature death and disability in England. The management of high blood pressure is standardised so it makes a good target for automation with a potentially large impact on clinician workload and public health. I also still do some work as a GP. 2. What opportunities are there for health tech development as an industry in the East Midlands? Is there a feeling that you have to be in London to be in health tech? There is certainly a lot more ‘noise’ in London! However, there is a thriving biotech industry in the East Midlands with bioscience incubators such as BioCity and MediCity in Nottingham along with the huge Boots campus. There is also an active tech community with meetups such as Tech Nottingham, attracting great speakers and regular hack events. All of this is fuelled by the large universities. We have found more events in London but have typically made ‘higher quality’ contacts in the East Midlands. 3. What do you hope to achieve from setting up Health Tech Nottingham? We hope to bring together our clinical colleagues, technical experts and business leaders to learn from one another and inspire one another. As a clinician, I am too often faced with an IT solution that has been developed with good intentions but without understanding the problem. We hope to see collaborations born from conversations that start at our meetup that then grow into genuinely useful products. It would suit ANYONE working in the clinical field (nurses, doctors, healthcare assistants, admin staff etc), anyone interested in lending their technical expertise to a health project and anyone with experience in how to make health tech projects financially viable. For more information about health tech startup Itamus and their current projects, visit their website: Itamus. 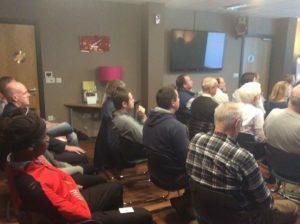 To join Health Tech Nottingham whose inaugural meetup is on 28th March 2017, visit their website.